Keep your eyes open at all times if you’re at the Ciel Hotel. If you dare to blink for even a second, you may have already been betrayed. Such is the life for our revenge-seeking characters. Even for the most vigilant of them, the most temporary lapse in focus has caused them to encounter harm in the least expected way. We know there are no real allies around here, but now there isn’t even standing room for frenemies either. So, moral of the story: keep your friends close and your enemies closer…but not too close. Roman is in such a state of shock from the possibility that Jae-wan might be Jayden that he doesn’t even bother to waste time thinking about whether or not to rehire him. He’s got bigger fish to fry! With Jae-wan rehired as Ciel’s GM, maybe he can bring some semblance of normalcy back to the hotel after these past few days of complete insanity. Oops, forgot that this is Ciel we’re talking about and it’s never normal here. Jae-wan isn’t the only familiar face back at the hotel. Mo-ne comes strolling through the corridors, but not in fancy high heels. Instead, she’s rolling a trash barrel in her new maid’s uniform. After having her job and home stolen by Chairwoman Baek, Mo-ne figures that her only way to remain at the hotel is to come back and work as a maid. She purposely stages an encounter with Chairwoman Baek while she’s meeting with a VIP to announce her return. She pretends to be extremely remorseful for her mishandling of the hotel and wants to pay back by working as a maid. The VIP is very uncomfortable seeing Mo-ne this apologetic, and urges Chairwoman Baek to allow her to continue to work at Ciel. Through extremely gritted teeth, Chairwoman Baek puts on a fake smile and agrees. Mo-ne is back, y’all! Mo-ne may be determined to stay at Ciel and take back the hotel, but it sure ain’t gunna be easy. Since she requested that the staff treats her the same as everyone else, they oblige by assigning her to clean Jae-wan’s house. They see each other when she’s leaving his place, but he ignores her. Awwwkward. The next day, she gets an even more fun task: cleaning an entire suite by herself. Mo-ne is surprisingly adept at the job and tidies up the place quickly and efficiently. That is, until the guest of the suite complains that Mo-ne threw out an important memo that contained top secret info for an $80 million business deal. Now lady, you’re sure you looked everywhere? Uh oh. Oh, what a coincidence to see you here. Mo-ne gets the unenviable job of going through all the bags of trash from the entire 7th floor to find this tiny piece of notepaper, or else she’s going to be fired. When Jae-wan hears about this, he goes to the guest to get to the bottom of things. The lady refuses to cooperate with Jae-wan, claiming that she can’t tell him anything because the info is top secret. He realizes that this is probably a hoax when instead of freaking out about losing an $80 mil deal in half an hour, the lady’s painting her nails. Jae-wan tries to stop Mo-ne from uselessly digging through the trash, but she ignores him and continues. After he finally drags her out of the trash room, Chairwoman Baek is there to inform them that the memo was actually under the bed sheets this entire time. Yeah, sure it was. Since Chairwoman Baek is going out of her way to get Mo-ne fired, Jae-wan figures that it’s time to retaliate. He calls up the reporter from before that gave him the recording from Chairman Ah’s suicide that shows Chairwoman Baek with him. He has the reporter pay Chairwoman Baek a visit, and he shows her the footage. Losing her cool, she breaks the reporter’s camera and orders him to leave. Just to further shut him up, she reports him to the police for soliciting a bribe from her. When Jae-wan finds out about all this, he casually mentions to Chairwoman Baek about how the reporter was sent by him. She tries to play it off as it being no big deal, but it’s pretty evident that she’s now officially worried about what Jae-wan will do. It turns out that after seeing Jae-wan’s tattoo and being 98% sure that he’s actually Jayden, Roman ordered someone to dig into Jae-wan’s past. 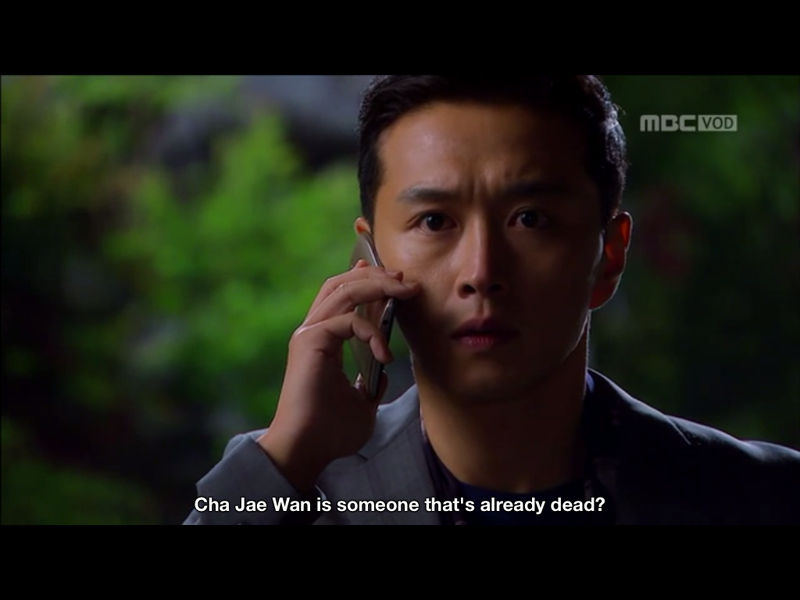 He learns that the person named “Cha Jae-wan” has been dead for 20 years, thereby confirming that he has indeed found Jayden hiding behind the “Jae-wan” name after all these years. Roman goes to Jae-wan’s place, dropping hints about missing his past and old friends instead of forthrightly telling him that he knows Jae-wan is Jayden. Jae-wan is oblivious to it and tells Roman that he never thinks about the past and his wings tattoo holds no special meaning. Ouch. Roman probably didn’t want to hear that. While he’s stranded at home without his friends or family, Joong-goo gets word of Roman looking into Jae-wan’s background. Some way and somehow Joong-goo also finds about the reporter with the footage from Chairman Ah’s death, and how he’s been working with Jae-wan. Joong-goo confronts Roman about his investigation on Jae-wan, and intentionally tells him how Jae-wan is trying to harm Chairwoman Baek with the video footage. Soon after, someone sends a group of thugs to attack Jae-wan and steal the USB containing the video, then leaving him for dead on the side of a road. Was this Roman choosing to sacrifice his “brother” for his mother? Or did Chairwoman Baek put out the hit on Jae-wan herself? Chairwoman Baek failed to find her son in NY 15 years ago, so she adopted Roman there instead. So is Jae-wan definitely her son then?! Chae-kyung finds out for Jae-wan that Chairwoman Baek is so wealthy because her husband was an illegal arms dealer in Hong Kong. He died three years after they got married, and she inherited everything of his. After Mo-ne went through the trash search ordeal, Woo-hyun cheers her up by playing basketball with her. Chae-kyung and Jae-wan walk by and see them. When Jae-wan is looking longingly at Mo-ne, Chae-kyung firmly reminds him of his promise to her to never be with Mo-ne. Even Roman can’t keep track anymore.